07-Dec-2014 -- With this visit, I have achieved a new personal record of 30 confluence visits in one year. I am very thankful for these opportunities. I rounded out the year with a trip to 34 North 117 West: I have visited this point several times, and I am not sure I would be able to return. One thing is clear, though: This was the last attempt I would make from the east. Why? Read on. 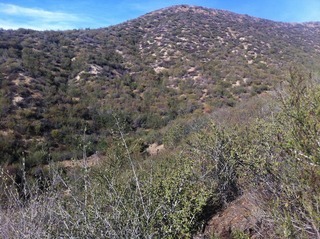 After landing at LAX airport, I drove east to Yucaipa and around the backside of this ridge. It was just two weeks before the winter solstice, and the sun angle at this time of year in the chaparral makes for beautiful lighting and pleasant temperatures. I parked at the end of one of the cul-de-sacs on the east side, and hiked to the top of the ridge, where someone has amazingly built a house and even a swimming pool. It was breezy as usual on the ridge, and I then hiked south along it, remembering not to exit too early onto one of the side hill spines, but to wait until the correct one. Taking the wrong trail, as I have done in the past, requires off-trail hiking through the thorny bushes, which is not enjoyable. I chose the correct path, and descended the steep ridge to just about 117 West. I then descended off-trail to the north-facing slope portion where I knew the confluence would be. After 10 minutes of pacing around, carefully placing my feet to avoid slipping, I had an unexpected surprise: I zeroed out the unit. During most of my visits here, I had not achieved that goal, because the confluence is located near the bottom of the ravine, and the GPS receiver loses contact with most of the GPS satellites, making the zeroing out of the unit nearly impossible. Today, though, due to the satellite configuration and time of day, the GPS read 34.00000 and 117.00000, not just for a moment, but for several moments, allowing me just enough time for a few photographs, one of which is included here. It was good to be back. I have visited this point in just about every season of the year, and in wind, sun, and fog. I keep thinking that I have visited this point so many times that I should let it rest, but I do love hiking in the chaparral, despite the physical challenges. I might come back to this spot, perhaps from the south-southeast that I used on my trip a year ago. This made for a long but rewarding hike. Also, I have always wanted to try from the south-southwest, and hike up the ridge from an even further distance away. This would require at least 5 hours. The southwest subdivision was gated, and therefore not possible, and the northwest approach is the one I had already used on my first few visits. Perhaps if I tried from the south-southwest, that would mean that I had tried the point from just about every direction. Not wanting to depart, as this was surely my last confluence visit of the year, I reflected for a moment. I had now visited 30 confluences this year, my all time record. Surely I would not ever break this record; that was over 1 confluence every two weeks. I was very thankful for these opportunities--from snowy fields of Illinois to Montana grasslands to Texas cotton and oil fields this year, and so much in between. Knowing I needed to scale the ridge and get some work done later this afternoon, I set out to the east the way I had come down, and the ridge was not too much of an effort. Wanting to make the hike a loop, as I do all of my hikes whenever possible, for variety, I then hiked southeast along the ridgetop for about 20 minutes, then descended on a different trail to the east, which would take me past the water tank that I had hiked past on a previous confluence trip. Owing to a recent rain, the trail seemed a bit more incised than I had remembered, and it required cautious footing, steep as it was. I neared the water tank and noticed a new driveway and house there and also farther downslope. Straight ahead was another new object since my last visit: A large gate, and I was inside it. Fortunately, a portion of the fence adjacent to the gate was unfinished, and though I walked through, I knew that any future visit without contacting the homeowners here would be impossible. This, the two cul-de-sac approaches to the ridge from the east are now both gated or chained. Once on the street, my hike was far from over, because the streets are very steep here on the east side of the ridge, and traversing up and down the streets, it was at least 25 minutes before I arrived back at the vehicle. It was such a radical landscape change, between the manicured lawns and the wild ridge, and I marveled at the physical and cultural geography here. This trek was a great way to begin my week here in southern California. #1: Site of 34 North 117 West, in the foreground, looking north. #2: View of the confluence, on the left side of this photograph down the ravine, from the ridge to the east of the point. #3: Spectacular view to the west from the confluence. #5: View to the east from the confluence. #6: Soil, rock, and thorny bushes mark the groundcover at this confluence. #7: GPS reading at the confluence point. A rare thing to zero out the unit at this confluence owing to the steep terrain. #8: Joseph Kerski at the confluence point in his 50 cent sunglasses. #9: 360 degree video with sound filmed at the confluence site (MPG format).